To my knowledge, except for Airfix’s veteran Kit 2302, this is the first offering of this range of vehicles in small scale plastic. (See the end of the review for informationon ARMO’s and Wespe’s resin LVT kits.) 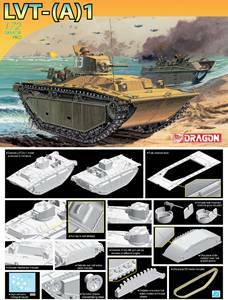 The in-the-box review will primarily cover DML’s (Dragon Models Limited) LVT(A)4 amphibious support tank, though I will briefly cover two other related DML LVT kits. 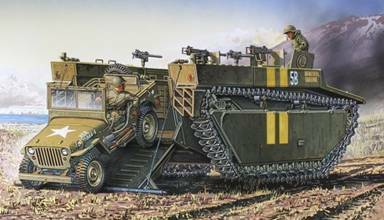 The “A” in the vehicle name stands for armored; LVT stands for Landing Vehicle Tracked. Though only lightly armored compared to a medium tank the LVT(A)s provided valuable support in combat and transport of troops and supplies between ship and shore. The Boxart: What is supposed to be inside. The LVT(A)4 was a support AFV mounting the turret of the M8 Gun Motor Carrier (GMC), a modification of the LVT(A)1 seeing service after March 1944. The LVT(A)4 was commonly known as an Amtank. 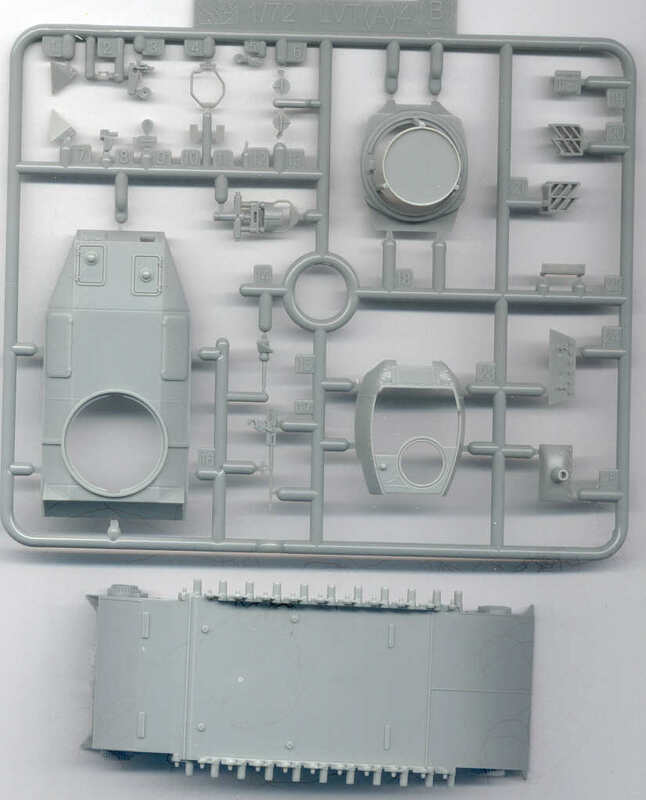 Starting at the top we see an open top with a 50-caliber machine gun mount and two crew figures (not included in the kit). Out of the gun mantlet is the short 75-mm howitzer and the hole for the gun sight to its right (our left). There is no coaxial machine gun next to the main gun. I imagine we could steal this turret for mounting on an M5A1 light tank kit to produce an M8 GMC (when someone gets around producing a 1/72-scale M5A1 instead of just more German tanks). The hull is totally covered by an armored roof unlike the LVT(A)1 and the LVT 4. At the front of the upper hull are roof hatches for the driver and radio operator (r/o), a flexible whip radio aerial (antenna). In front of the r/o position is a 30-cal. machine gun mount. Many photos I’ve seen of the LVT(A)4 do not have this bow machine gun. The amphibious hull is boat shaped with cleats for lashing lines and securing the AFV to a ship when it is acting like a vessel on the water. The tracks and suspension are reminiscent of the French Char B1bis tank and English tanks of WW1. The track has deep treads which provided propulsion in the water. This LVT(A)4 is painted in olive drab with markings identified as from the US Marine 3rd Armored Amphibian Battalion assaulting Peleliu from September to November of 1944. (For more information on this battalion see http://en.wikipedia.org/wiki/3rd_Assault_Amphibian_Battalion or the Harry Yeide book) I can only find evidence that the LVT(A)4 was used by US forces in the Pacific Theater (the Allies second major front) and none served in Northern Europe or were Lend Leased to the USSR. This poster is borrowed from Dragon’s website and shows computerized drawings of the kit features. 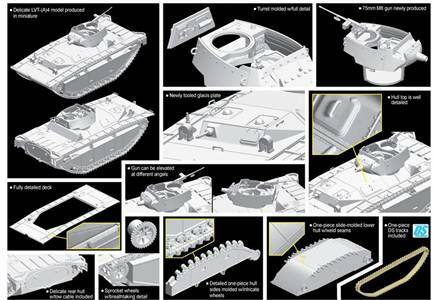 From DML’s website this is their poster of their LVT (A)1 Kit #7387; an amphibious tank, or Amtank, with a turret from M5A1 light tank mounting a 37-mm M6 gun. 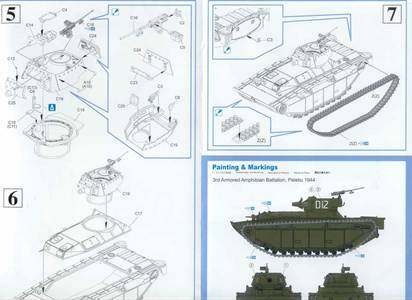 Though I do not yet have this model kit, so I have not examined it’s parts, it appears that it is the same as the LVT(A)4 model except for the upper hull and turret. Besides having a fully closed turret and 37-mm tank gun, it has behind the turret two open cupolas with 30-cal. machine guns with shields. Like the LVT(A)4 kit, the driver and r/o hatches are molded closed and there is no interior hull detail. There is no bow machine gun for the radio operator. The very nice boxart shows an LVT(A)1 in olive green and coming ashore with two crew figures visible. On the starboard side near the bow is the radio antenna. In the background are several unarmored LVT(1) tractors carrying troops ashore. At bottom left are the water slide decal markings. 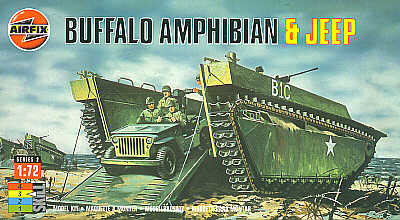 Here we have the box art for DML’s 1/72 LVT4 Water Buffalo kit #7389 which includes a 1/4-Ton 4x4 Truck (a.k.a. Jeep). At this time this kit has not yet been released so I have not seen the parts to comment on. I have heard that the Jeep is actually 1/76-scale but have not yet confirmed that myself. This vehicle was commonly known as an Amtrac or Amtrack, short for amphibious tractor. 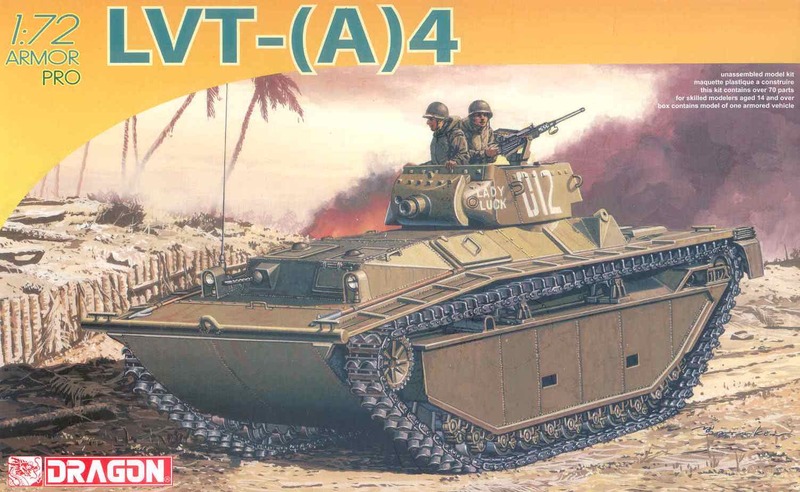 The LVT4 was different from other LVTs in having the engine moved up to just behind the driver, while at the same time it had an armored ramp at the rear and armored cab. With the earlier LVT2 the troops and cargo had to be loaded and unloaded over the sides, we can see how a rear ramp would be much preferred by the crews and troops! It was first used in the Pacific during the Saipan landings in mid-1944, and also in Italy and Europe by US, and British forces (known as the Buffalo IV). The LVT4 could carry a Jeep and 37-mm AT gun, a 57-mm AT gun or a 105-mm howitzer. The LVT4 is painted in olive green with vertical yellow stripes amidships, a vehicle number and a name that looks to be BEAUTIFUL QUEENIE. On the sides of the cargo compartment are mounted two 50-caliber and two 30-cal. machine guns. At the rear there are two red taillights. 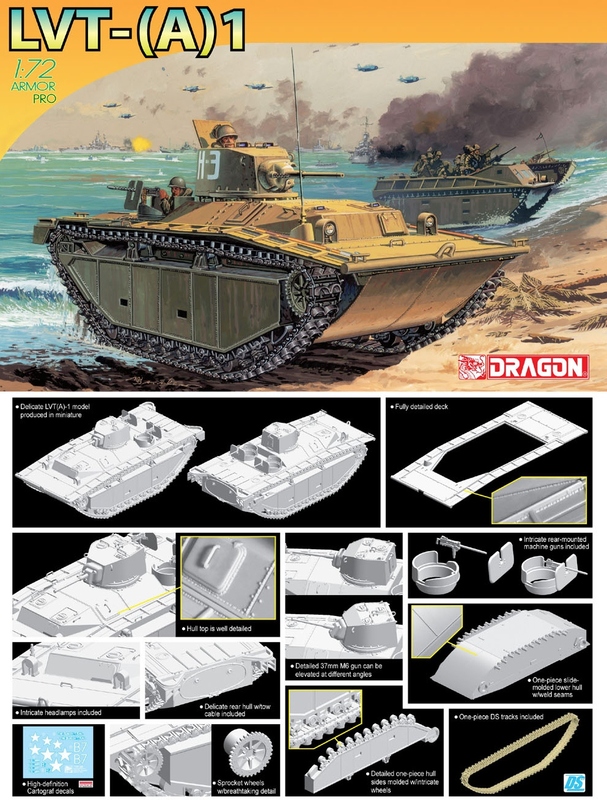 The Dragon LVT(A)4 kit contains 66 light-gray, injection molded styrene parts on two sprues. There are also four parts to assemble two band track lengths out of DML’s special track material. There are no crew figures which is a shame considering that DML has shown they can make superb 1/72 scale figures. There are no etched brass parts. 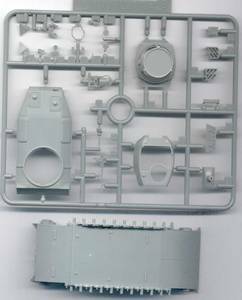 The scan shows the parts particular to DML’s LVT(A)4 kit and shows the upper hull with the hatches molded closed (part C17), the turret top and bottom in the center (parts C18 & C19), the 75-mm howitzer parts (parts C4, C14, C25, etc.) and gunner and commander seats. Molding quality and detail are very good. There is some nice interior detail for the open-top turret but no interior detail for the LVT interior, not even a floor. Make note that though the parts diagram and assembly instructions call this sprue “C”, the sprue itself at upper right is labeled sprue “B”, go figure?! In the lower center is the 50-cal. Machine gun (parts C16, C9 and C2). At the very bottom is the lower LVT hull (part B) common to all DML’s LVT kits. The hull side, suspension axles and details are slide-molded in. One feature I am not fond of is that there is a tow cable molded onto the rear of this hull part; I prefer separate tow cables. 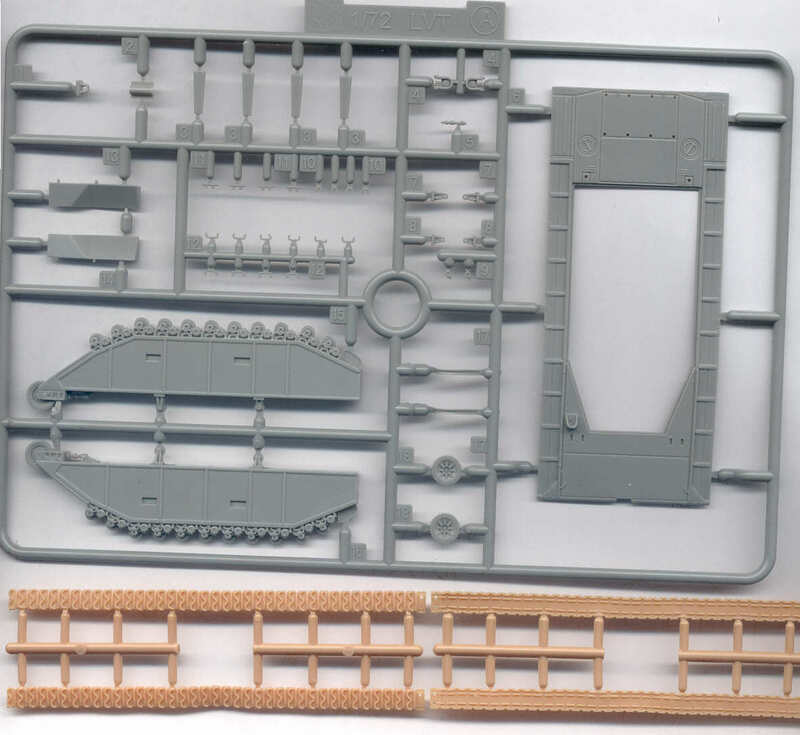 This second scan shows sprue-A which is common to the other LVT kits released by DML. At right is the LVT deck and fenders over the tracks (part A6). Two boathooks are molded onto the deck which disappoints me a bit. 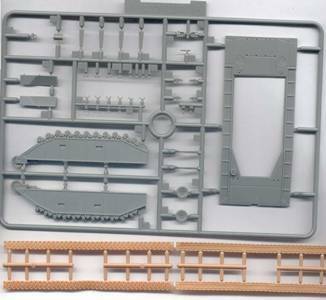 Considering that this LVT model has fewer parts and less plastic than a DML Sherman or PzKpfw IV kit, I think separate boathooks and tow cable is not too much to ask for. 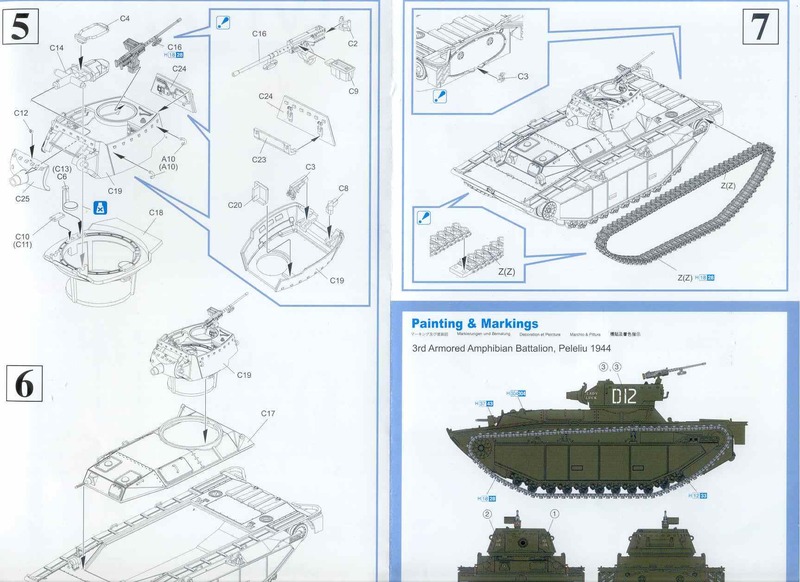 At the bottom of the scan are the LVT tracks common to DML’s kits. I usually use cyanoacrylate (super) glue to assemble my tracks but we are supposed to be able to use styrene cement to attach the ends. One Dragon kit I have explains that if the tracks are tight they can be carefully stretched to fit better. I recommend you glue the track down to each roadwheel with a little super glue. Here is a part of DML’s exploded-view assembly instructions broken down into pretty clear and well laid out parts. At lower right is part of the three-view color painting and marking guide. There are additional markings for one three-color camouflaged LVT(A)4 for the 2nd Armored Amphibian Battalion on Iwo Jima in 1945. Overall I think this is a great kit and long needed for small scale modelers. I do wish that DML had molded the hatches separate. So far I have not heard from anyone about the fit of the parts. Both this LVT(A)4 and the LVT(A)1 kits are perfect for a good etched brass set and a full resin cast interior. Both ARMO and WESPE make 1/72-scale cast resin kits of LVT’s (kits AR72118, AR72119, AR72120 and WS7269). Milicast make two sets of cast resin crew figures for LVT kits in 1/76 scale but which are totally fine for 1/72-scale (sets MILFIG14 and MILFIG 15). THE AMERICAN ARSENAL, World War II Official Standard Ordnance Catalog of Small Arms, Tanks, Artillery. Greenhill Books and Stackpole Books (1996) ISBN 1-85367-470-2. British And American Tanks of World War Two, Peter Chamberlain and Chris Ellis, Cassell & Company (1969); ISBN 0-304-35529-1. THE INFANTRY’S ARMOR, The US Army’s Separate Tank Battalions in World War II. By Harry Yeide, Stackpole Books (2010), ISBN 978-0-8117-0595. Though mostly full of information and stories about the M4 Sherman and light tank Battalions this book also has several chapters devoted to the history of Amphibian Tractor Battalions in both the Pacific and European theatres.